Dartmouth quarterback Jack Heneghan ’18 drops back for the snap, looks to his left to see wide receiver Drew Hunnicutt ’19 streaking toward the middle and fires into the opening for the game-winning touchdown. Only Heneghan is not on the grass of Memorial Field; he is standing in his own room, running through repetition after repetition wearing the team’s virtual reality headset from STRIVR (pronounced “striver”) Labs. Sports Training In Virtual Reality is a state-of-the-art virtual reality training company that Dartmouth football uses to enhance player in-game performance by providing an immersive sports video consumption experience off of the field. The virtual reality product, which launched in 2015 and was named Sports Illustrated’s Innovation of the Year, has spread across the sporting world, making its way to professional and collegiate football, basketball, soccer and hockey programs. Dartmouth football has adopted STRIVR into both its mandatory and optional training regimens, giving the team an edge as the only Ivy League team with the technology. Considering the impact STRIVR has made in transforming the Dartmouth off-field training experience, head coach Buddy Teevens ’79’s early exposure to the company was a stroke of luck. Teevens said he first discovered STRIVR when reading a USA Today article about the newly launched company. Having served as Stanford University’s head coach from 2002 to 2004, his interest was piqued when he saw the names of former Stanford kicker Derek Belch, STRIVR’s founder and chief executive officer, and quarterback Trent Edwards, vice president of product, so he called them up. Still, Teevens had serious concerns before trying on the headset. But when he actually gave STRIVR a try, Teevens said he was astonished. At that moment, Dartmouth’s early partnership with STRIVR was born. “They were just starting out, and I expressed my interest, and certainly they were willing to help us,” Teevens said. Heneghan discovered STRIVR in its early stages during his freshman spring break in 2015, before Dartmouth began using the product. His fascination with STRIVR did not end there. Heneghan was so impressed with the technology that he took the extra step of taking an unpaid internship there. “After using the STRIVR headset for about a year, I was going home to Menlo Park, California for the winter and reached out to STRIVR saying, ‘I really like the product, I’ll be home for the six-week break, I’m willing to work for free, and this is something I really believe in,’” he said. As STRIVR became a more important part of the Dartmouth football system, Heneghan watched the Silicon Valley startup soar in popularity. Virtual reality has gained prominence in recent years for its ability to fully surround its users in an enthralling alternate scene. Lorie Loeb, a Dartmouth computer science professor who utilized VR to create homelike experiences for astronauts on extended missions, provided some insight on the technology. Loeb explained how VR technology functions. STRIVR aims to capitalize on this technology by giving it a practical purpose: training. Heneghan said he has been blown away by the experience of using STRIVR, logging more hours using it than any other football player at any level, according to Teevens. As of now, STRIVR can only stitch film together from plays videographed during practice. Loeb said what makes the virtual reality experience work after filming and stitching is completed is the ability to move within the scene. Players have been able to watch video in a more immersing setting than two-dimensional film as a result of STRIVR’s recreation of live 3D scenes. For Heneghan and the rest of the football team, STRIVR has transformed the training experience and given the Big Green a technological upper hand over the rest of the league. Heneghan would use STRIVR six days a week, 10 to 30 minutes on non-game days and 30 to 40 minutes before every game. Teevens strongly attributed Heneghan’s emergence as a premier Ivy League quarterback to his extensive use of STRIVR. The sheer number of repetitions outside of practice is where Teevens sees STRIVR making its biggest impact. The formalized training program for using STRIVR also allows players to fully comprehend their coaches’ feedback. “[Getting feedback] makes sense in terms of the verbiage, but when you actually see it on tape it’s ‘Wow, man I know what he’s talking about,’ so it’s a tremendous teaching tool,” Teevens explained. Beyond the formal program, the technology is available for any player who wants additional training, which mimics football practice, even off the field. While STRIVR was vital for the team’s success this year, some of the main future beneficiaries of the system may have not yet garnered much playing time. Heneghan said using STRIVR earlier in his career allowed him to practice even without playing many minutes. STRIVR may even benefit Dartmouth in relation to students not yet enrolled, as Teevens said he believes that it can serve as an important recruitment tool for years to come. After a successful 8-2 season filled with late comebacks and excellent play from Heneghan at quarterback, Dartmouth looks to keep improving in 2018 with the help of STRIVR. With STRIVR in tow, the Big Green have found some success, but any technological advantage figures to close as more teams innovate with companies such as STRIVR. Heneghan identified health and safety as a primary, large-scale priority of the football community which STRIVR could further. For similar reasons as Heneghan, Teevens sees STRIVR creating a safer football environment and hopes other programs will realize this benefit. For now, at least, Dartmouth football seems to be ahead of the sports technology chase. 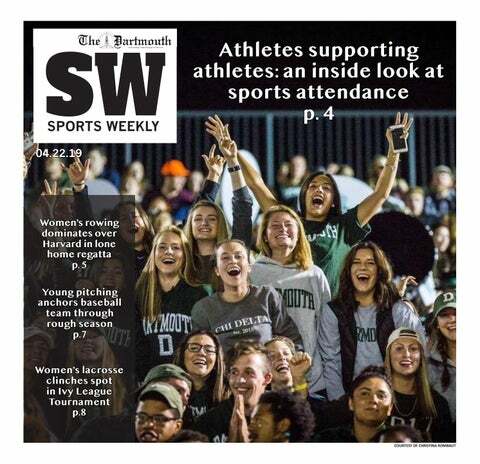 Until the rest of the league catches on or other products come onto the scene, their players will reap the benefits of Dartmouth’s innovative acquisition, both on the field and in the comforts of their own dormitories.